At our Annual Meeting last week, I laid out a strategy to combine the strength of the Chicagoland Chamber’s 114-year legacy with a new, innovative outlook focused on helping our members meet the demands of the ever-changing 21st century economy. Networking, Advocacy and Thought Leadership remain our pillars. But we’ll approach them in very new ways. We’ve already taken the first steps. I’m excited to introduce Chamber Connect. The idea for this came from something already happening: Chamber members meet one another, and they end up doing business together. Examples of this, featuring people you may have met yourself at Chamber events, are in a video on our website. We’re creating a user-friendly process to encourage Chamber members to do more business with each other. When a Chamber member is looking for a product or service, we will do everything we can to make sure your business knows about it. The first step is to nominate someone in your organization to be our Chamber Connect point-person. We call this your Chamber Connect Champion. Please designate someone to fill this role and go to this webpage to tell us who the person is. You can also email Michael Stark with the information. This is a great new opportunity, for Chamber members only, to leverage the Chamber network for new business. Pushing for an infrastructure bill in Springfield that upgrades our mass transit, rail and roads. Fighting the mandated scheduling ordinance being considered by the City of Chicago. Under this proposal, if you change your workers’ schedule less than 14 days out, you pay time-and-a-half, you pay a fine, and you open up your business to litigation. The plan would also decrease the flexibility that today’s workers demand. From my own experience in government, I know how to advance pro-business policies and a business-friendly climate. I worked with hundreds of companies to get them to move here and stay here. Our state and region have a lot of work to do, and the Chamber is going to be a leader to get it done. For more information on our advocacy efforts, contact Michael Reever, Senior Vice President of Strategy & Government Relations. His email is here. In Chamber surveys, talent acquisition and retention are often cited as the number-one priority for Chicago-region businesses. That’s why we’re infusing talent as a focus across all Chamber programs. Talent First is a multi-faceted initiative that aims to make Chicago a global hub for talent. Following an investment from JPMorgan Chase, we are in the process of launching the Chicago Opportunity Exchange with our private and public sector partners. The Chicago Opportunity Exchange is designed to create a more diverse, inclusive and efficient labor market throughout the Chicagoland region. Its sophisticated talent-matching platform will connect job seekers with employment opportunities, simplify the hiring process for businesses, and reduce unconscious bias in the recruiting process. I’m also pleased to announce that the Chicagoland Chamber secured a line item in the state budget to help workers acquire new skills, and help companies fulfill their workforce needs. We look forward to working with Director Sean McCarthy and his team from the Illinois Department of Commerce & Economic Opportunity to develop a program that puts talent first and helps companies meet the demands of the workplace of the future. For more information on our workforce initiatives, please contact Joey Mak, VP of Programs, at JMak@chicagolandchamber.org. 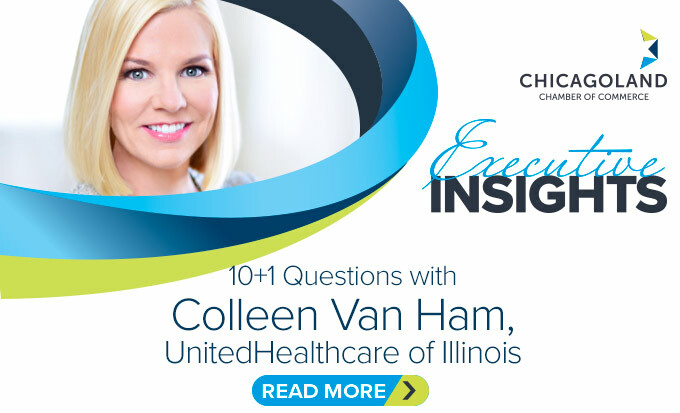 The new initiatives of the Chicagoland Chamber will greatly enhance the value of Chamber membership. They were inspired by your input about how the Chamber can be an even better partner to you. I’m excited to be putting them into action and infusing the Chamber with new energy. Finally, I want to recognize the Special Olympics as it celebrates its 50th Anniversary. The Special Olympics started right here in Chicago, in 1968 at Soldier Field. Today, they’re in all 50 states and more than 175 countries, and they’ve had a profound impact on millions of families worldwide, including my own. It is something Chicago gave to the world and we should be proud. I ask our business community to support the 50th Anniversary celebration. Later, in this newsletter, there is information about how you can get involved. Special Olympics celebrates its 50th anniversary this year! Special Olympics was born in Chicago in 1968 and has since grown into a worldwide movement engaging millions and making Chicago proud. Watch this video to learn more about its incredible history and visit www.specialolympics50.org to learn about special events happening July 17-21 that need your corporate support. Donate here. Pamela Self Landscape Architecture completed the 2.3 mile stretch of planters along Michigan Avenue. Almost 25,000 annual plants were placed. The work took 10 people a total of 406 hours. Thanks for making Chicago beautiful! Earn your Master's Degree in as little as 18 months at Robert Morris University - Classes begin July 16th. For Father's Day: T-Mobile Mag Mile offers complimentary hot lather shave-and-haircuts for dads. This Saturday and Sunday, noon-6pm. Julia Skuibida American Family Agency Inc.